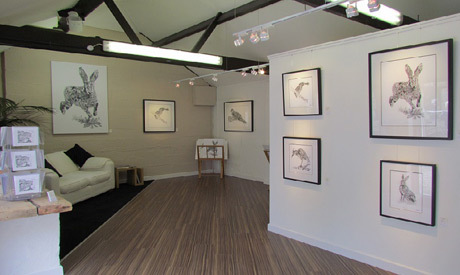 Jon’s gallery and working studio is situated at The Old Forge, Lelant, just off the main route to St Ives in Cornwall. Here you will see a large selection of Jon’s art and have the opportunity to meet and talk with him. You will usually find Jon working at his drawing table on his latest piece. Available to purchase are prints, large canvases, cards and original art work. During your visit to the studio you might like to enjoy the nearby RSPB Nature Reserve; inspiration for many of Jon’s drawings comes from here with an average of 18,000 birds visiting throughout the year. Also within yards of the studio is Scarlet Wines Restaurant, Birdies Bistro and the St Ives park and ride railway, an opportunity for a great day out!